Full color printing for your marketing message. As you may have heard, Proforma has landed an exclusive contract with the world’s first global lost property recovery system, HomingPIN. This means Proforma is the only distributor in the U.S. promotional products industry to offer HomingPIN. Whether it’s your suitcase, backpack, cell phone or tablet, HomingPIN protects all consumers’ belongings while protecting their identity. 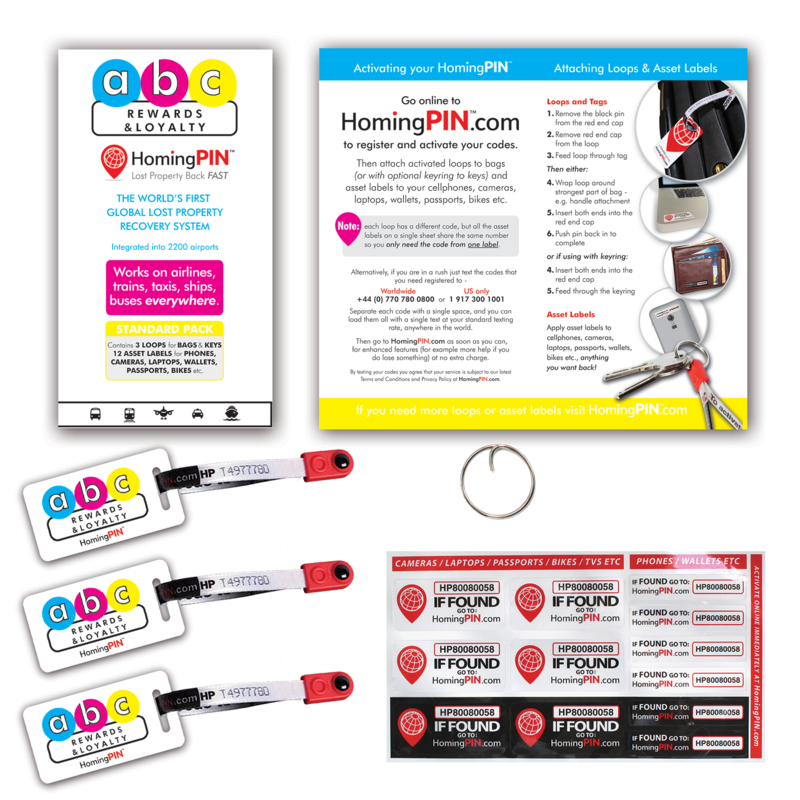 HomingPIN can be fully branded with your client’s logo or color scheme and can even provide access to their new and existing customer details through data sharing. As a promotional product HomingPIN checks all the boxes. HomingPIN is cost effective. HomingPIN offer bold, full color replication of your brand and message. HomingPIN places your brand message in people’s homes on their stuff, including things they use everyday like laptops, tablets, key, and computers. If a lost item is recover, it is your brand that will benefit from that good will. In the Air – HomingPIN is available for purchase at all Brookstone airport stores throughout the US. Airlines throughout the world will be providing sample packs to their passengers because we reduce / remove a problem that cost the industry over $2 billion in 2014. On the Rails – Rail companies handle millions of items of lost property each year. In most cases they cannot locate the owner, but could if the owner had used HomingPINs. In 2015 HomingPIN launched across all major UK Virgin Trains stations protecting bags and valuables for Virgin Trains customers. On the Road – The AAA (American Automobile Association) has 54 million members in the US / Canada. HomingPIN is available on the AAA website and at many of their retail locations. HomingPIN was described in the AAA’s WorldWise Magazine as the “Must Have Travel Accessory of 2015”. loops work great on laptops cases, school or gym bags and asset labels can be applied to anything you deem valuable, such as, cell phones, tablets, sports equipment, passports, cameras etc. Insurance – HomingPIN adds real value to insurance products, improves the service (most people would prefer to have their property back than a claim), and will reduce the claim ratio. One of the world’s largest insurance companies will be providing free HomingPINs to policy holders imminently. Branded Merchandise – Your logo on the tags and packs. This is a more relevant and innovative gift for companies than the usual promotional items (e.g. pen / mug / mouse mat etc.). Your logo would be advertised on customers bags, often for years to come. For more information, please watch this video. Please contact us at info@proformagreen.com if you would like more information on – or samples of – world’s first global lost property recovery system, HomingPIN.